The Saint Paul & Ramsey County Domestic Abuse Intervention Project (SPIP) is a grass-roots organization that exists to eliminate violence against women and their children, and the social and system responses that condone or allow its oppression. 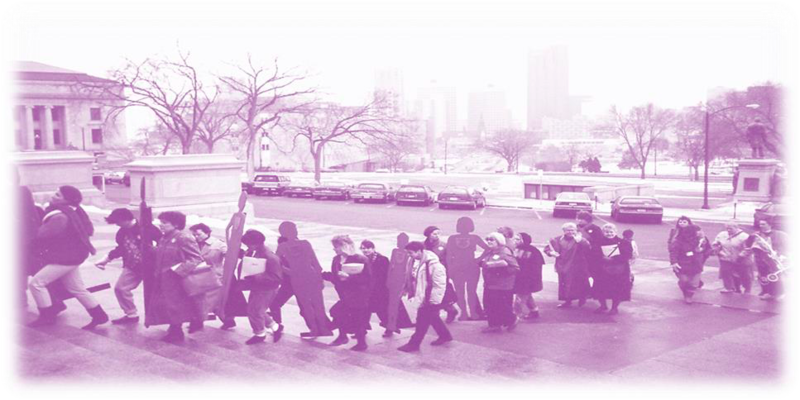 Our organization believes that domestic violence is a crime and every victim/survivor has the right to access the criminal justice system, receive safety through the laws that are designed to protect them, and obtain the critical support and services they and their children deserve. We affirm that all victims of domestic abuse must be free to make their own choices, have the right to dignity and possess the capacity to make sound decisions if free from the violence that obstructs these choices. We further believe that no one has the right to abuse anyone and no one deserves to be abused regardless of spiritual belief, mental or physical ability, age, race, sexual orientation, partner/marital status, gender, or socio-economic background. 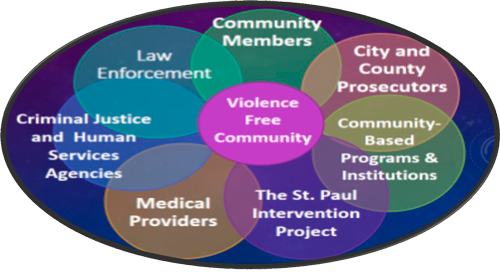 The Saint Paul & Ramsey County Domestic Abuse Intervention Project is a non-profit, community-based organization founded in 1985 to assist victims of domestic violence. We grew from a cooperative community group's finding that "intervention by the criminal justice system was a critical unmet need in our community." To meet this need, we began providing direct services using the criminal justice system to change the batterer's behavior, while also providing increased protection and critical services to the victim. Annually, over 5,700 battered women (and their children) receive direct services from St. Paul & Ramsey County Intervention. Over 18,000 informational packets are distributed each year and 9,000 more call for support, information, and referrals on our 24-hour crisis line. We have grown and now provide ongoing transitional services and community education, as well as outreach and advocacy to the Latino community, the Southeast Asian community, the Somali community, to older battered women, children of battered women, battered women in the health care system, etc. Collaboration is at the heart of our agency. Our partnership with the community has enabled our program to work jointly with community members, public and private institutions, groups, and institutions. These networks enrich our resources, ideas, services, and our ability to work towards long-term social and system change to end domestic violence. As our agency has grown, we have strived to remain faithful to our roots, growing in response to what the community needs. Our focus remains on the needs of the victim. We bring programs and services directly to victims, continute to educate community agencies and public systems on domestic abuse, and create partnerships within the community to create a society that will no longer tolerate violence against any of its members. To do this work requires many experienced and dedicated hands. Our staff, board, and volunteers reflect the diversity of the community we serve. We consist of elders, younger women, Latinos, European Americans, African Americans, Southeast Asian Americans, immigrants, refugees, lesbian and bisexual women, as well as women of diverse economic and professional backgrounds, and varying spiritual beliefs. 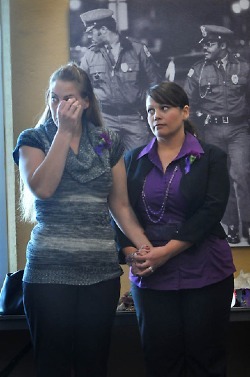 Many of these women formerly have experienced domestic violence in their own lives. Just as violent people come from all walks of lives, so do we—those who propose to end the violence. 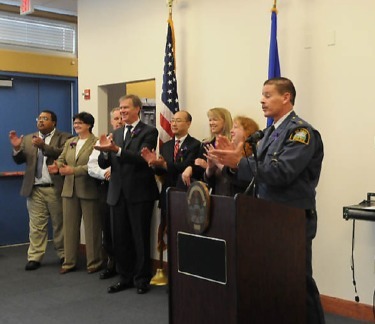 The Saint Paul & Ramsey County Domestic Abuse Intervention Project recognizes that the provision of culturally appropriate and diverse programming helps build resiliency, fosters dignity, and encourages a clear sense of identity. We strive to ensure that diverse and culturally-based programming is delivered by staff, who intimately understand the culture, life-styles and realities of the people we intend to serve. Our partnerships with government & community-based agencies have an enormous impact on victim safety, perpetrator accountability, and the way our community responds to domestic violence. Within these partnerships, we have gained elevated respect, mutual understandings and alliances. Saint Paul and Ramsey County have become national leaders in confronting the serious issue of domestic violence. Our successes, as well as our commitment to move forward, is due to our community organizations’ and government systems’ unique ability to “step out of the box,” and join their voices to end domestic abuse.